If you’re stuck for what to get your loved one this Valentines Day and are tight on budget, why not make them something special? There are plenty of gifts that you can make yourself by up- cycling old boxes and other household items. 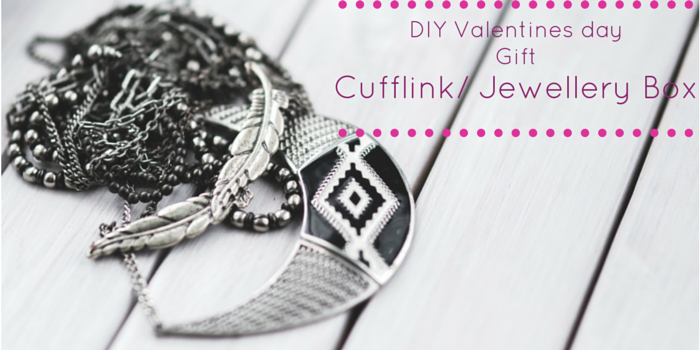 Why not have a go at making a cufflink/jewellery box? It’s perfect for everyone and is easy to make. Cut your lightweight cardboard 3mm smaller, than the bottom of your box, on each side. Decide on the proportions you want for the padded area and the flat area, then cut the cardboard into the two sections. With the piece of cardboard for the padded area, draw lines roughly 25mm apart down the length of cardboard. If 25mm does not fit exactly then change accordingly, keeping the measurements as close to 25mm as possible. Cut foam to the width of the cardboard and double the length (around 50mm), gently using a craft knife so as to not damage the foam. Heat up the glue gun. Once the glue is warm enough, apply a straight line along one side of the first section. Quickly stick down one width of the foam then wait for it to dry. Once the glue has dried apply another line of glue to the other half of the section and stick the other width down. Keep doing this for each section. Test to make sure everything fits in the box, the cut another piece of cardboard which is 9/10mm higher than the padded piece. Fold the edge over the top of the padded area. Repeat on the other side. Cut two pieces of fabric that is 25mm bigger on each side of the cardboard you’ve just cut out. Cut the corners of the fabric then fold and stick to the back of the cardboard. Glue the two pieces to each side of the padded area. Glue the fabric to the flat piece in the exact same way you added the fabric to the last pieces of cardboard. Then glue both the flat and padded area to the inside of the box. Decorate the outside of the box how you wish.